Row 2: Purl 1st two stitches together (tog), purl to last stitch. 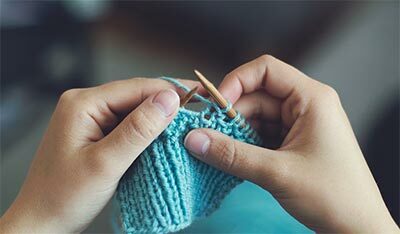 Knit twice in last stitch. Row 4: Purl 1st two stitches tog, purl to last stitch, knit twice in last stitch. Row 8: Knit 1st two stitches tog, knit to last stitch, knit twice in last stitch. Repeat these 12 rows 7 times (9). Cast off. Pick up 86 (108) stitches on bottom or piece. Knit one, Purl one for 20 (30 Rows with Main Color yarn, sew up side seam, gathering top together. Make pom-pom and sew to top. 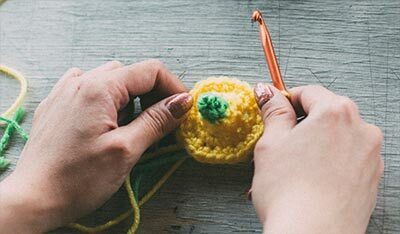 You may pick up stitches on double pointed needles or a circular needle to knit the rib on the bottom of the cap. Note: This amount of yarn will make 2 caps. If you want a solid color cap you just need one skein of yarn. 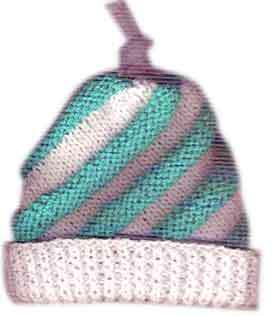 For a Rainbow Cap (multi-colored effect): Add different colors on knit rows and white on purl rows.